When the Treasury Department ordered a halt to the paying out of silver dollars in March of 1964, it looked like the final chapter had been written for these historic coins. Surprisingly, Congress voted that same year to coin 45 million additional silver dollars. Coming in the midst of a severe nationwide coin shortage, this seemingly frivolous employment of the Mint’s machinery and manpower was terminated after just 316,076 pieces had been struck, and these coins were never issued. 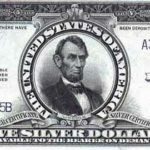 The Coinage Act of July 23, 1965 included a provision that no standard silver dollars were to be coined for a period of five years. The situation could then be re-evaluated at that time. As the end of Congress’ five-year ban on silver dollars approached, the idea was conceived for a circulating dollar coin to honor war hero and two-term President Dwight David Eisenhower, who had recently died. With silver long gone from the nation’s dimes and quarters, and with ongoing debate over its discontinuance in the half dollar, there was never any serious consideration of including the precious metal in circulation strikes of the new Eisenhower dollar. There were those, however, who argued for a silver collectors’ edition to be sold at a premium over face value. Congressman Bob Casey of Texas introduced a bill into the House on October 29, 1969 calling for a circulating commemorative dollar to honor both Eisenhower and the Apollo XI space flight, mankind’s first landing on the moon. More than a year of political wrangling was to follow before this bill was finally approved in a modified form. Along the way, the U.S. Mint prepared an alternative reverse design featuring a heraldic eagle that looked, in the words of noted numismatic author Q. David Bowers, like something one would find on a Mint pattern of the 1870s. Reportedly, one of the two proposed reverse designs (probably the Apollo XI image, given its implications for the world’s future) originally featured an eagle whose expression the U.S. State Department feared other nations would interpret as hostile. Whether the eagle which ultimately did appear on the coin’s reverse is a “friendly” bird is difficult to ascertain from its neutral expression. Becoming law on December 31, 1970, the bill that created the Eisenhower dollar providing for a circulating coin made from the copper-nickel sandwich or “clad” composition then being used for dimes and quarters (and for half dollars beginning in 1971). 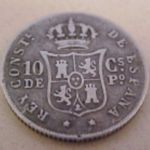 It also permitted the coining of up to 150 million silver-clad coins for sale to collectors. These would be coined in the same composition lately used for halves dated 1965-70, two outer layers that were 80% silver and 20% copper bonded to an inner core that was approximately 21% silver and 79% copper. This created an overall mix that was 40% silver, with the balance being copper. A controversial amendment to this bill provided that a portion of the profits from the sale of these collector coins would be donated to Eisenhower College, a private institution in Seneca Falls, New York which ultimately folded despite receiving some $9 million dollars from this source. As Mint Director Mary Brooks wanted the coins produced quickly, there was no time for a public design competition. Chief Engraver Frank Gasparro was directed to prepare the models in as little time as necessary. Anticipating this coinage, Gasparro had already begun work; his galvano for the obverse bore the date 1970, even though the first Ike dollars were dated 1971. His design portrays on the obverse a bare-headed, left-facing profile bust of the late president. Arranged in an arc above him is the legend LIBERTY, while the motto IN GOD WE TRUST appears in two lines below Eisenhower’s chin. The date is at bottom, with the mintmark (if any) above it and to the right. Gasparro’s initials FG are on the truncation of the bust. The reverse depicts the American eagle, an olive branch of peace in its talons, descending onto the moon. The distant Earth is in the field above and to the left. The motto E PLURIBUS UNUM is centered above the eagle, and the legend UNITED STATES OF AMERICA is arranged in an arc around the upper periphery. The value ONE DOLLAR is superimposed on the moon’s surface along the lower periphery. An arc of small stars surrounds the eagle, Earth and the motto. The initials FG appear below the eagle’s tail. Why the coins were not ready to be issued until November 1, 1971 isn’t certain, although it was rumored that numerous trial strikes were rejected because of design deficiencies. 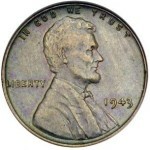 Collectors snapped up a good portion of the dollars released that day and for some months afterward. Still, enough were coined that they ultimately reached the channels of commerce. It was only then that the fundamental flaw in Congressional thinking was revealed: the American public simply had no desire to use these large and heavy coins. True, gambling casinos welcomed the return of real dollar coins to supplant the dollar-sized tokens that had been utilized since 1965, but even the casinos ultimately tired of these coins. Too often, customers took them home as souvenirs, since they were seldom seen elsewhere and people imagined them to be rare. With a dropoff in demand for new Ike dollars, the Mint opted to strike only enough of the 1973 edition to fulfill orders for uncirculated coin sets from collectors. This left a net mintage of less than 2 million each for the Philadelphia and Denver Mints. From the outset, San Francisco had coined only the special collector coins: the uncirculated edition of the silver-clad composition (known from its packaging as the “blue Ike”) and the proof version of the same coin (known as the “brown Ike”). Beginning in 1973, it also coined a proof version of the copper-nickel coin for inclusion in the regular proof set. The nation’s impending Bicentennial resulted in a competition for commemorative designs to grace the reverses of the quarter, half and dollar, respectively. 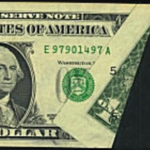 The winning design for the dollar’s reverse was submitted by Dennis R. Williams, whose clever concept of the Liberty Bell superimposed on the moon provided a link between past and present (his initials DRW are found to the right of the bell’s clapper). 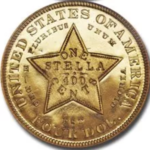 The regular dollar coinage dated 1974 continued until the middle of 1975, when production of the new Bicentennial designs dated 1776-1976 began. This left no dollar coins dated 1975. The Bicentennial pieces were first released in the fall of 1975, and their mintage continued through the following year. Silver-clad coins were made at San Francisco, in addition to the circulating version coined at Philadelphia and Denver. 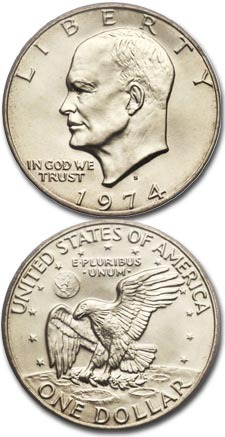 The regular design returned in 1977 and 1978, when the Eisenhower series was terminated in favor of the ill-fated Susan B. Anthony “mini dollar.” For these two years, however, no Ikes were coined in silver. There are no rare dates within the regular coinage of Eisenhower dollars, although several issues, particularly 1971 and 1972 dollars from the Philadelphia Mint, were poorly made and are difficult to locate choice. A number of minor varieties resulted from refinements to the hubs during the first few years. The Bicentennial coins exist with either the Variety 1 reverse (broad letters) or the Variety 2 (narrow letters). A small quantity of silver-clad dollars were made at the Denver Mint in error and may be found dated 1974-D, 1976-D or 1977-D. Proofs of the Bicentennial dollar were coined in 1974 at the Philadelphia Mint without a mintmark, but none are currently known to survive. A single silver-clad proof of the second variety has been documented without a mintmark, its place of origin unknown. No coins minted for the year 1930? What do the sayings on coins represent?